(TORONTO, ON – September 30, 2016) The Toyota Highlander already enjoys a sterling reputation as the no-compromise three-row mid-size SUV. That’s because Highlander drivers enjoy its winning combination of style, comfort, versatility, drivability and safety. Now, Highlander fans can enjoy even more of what they love, with a significantly updated line for 2017. Toyota Highlander offers room for up to eight adults, a choice of conventional gas and advanced hybrid power trains and FWD or AWD drive trains. For 2017, the Highlander lineup is enhanced with updated styling, plus new and updated equipment and technology – inside and out. Toyota is committed to leading-edge safety – and that’s why all 2017 Toyota Highlander models are standard equipped with Toyota Safety Sense P. This new multi-feature advanced safety package enhances driver safety in three important areas; by mitigating forward collisions, assisting drivers with staying on course in their lane and improving nighttime visibility, using a variety of cutting edge safety technologies such as a Pre-Collision System (with forward collision warning and automatic emergency brake, plus Pedestrian Detection), Lane Departure Alert with Steering Assist, Automatic High-Beams, and Dynamic Radar Cruise Control. Toyota Safety Sense joins a long list of other safety features, including the Toyota Star Safety System, eight airbags, a back-up camera, new rear seat seatbelt warning system on all trim levels and more. Several enhanced safety systems are also available on select trim levels – including the Blind Spot Monitor with Rear Cross Traffic Alert (XLE and Limited), and the Bird’s Eye View Monitor, parking assist sonar and rain sensing wipers (Limited). Highlander’s exterior design conveys head-turning prestige and strength, starting with a new upper and lower front grille design on all models. Each grade is distinguished by unique grille finishes that also carry into the headlamp housing. Those headlamps are also new – featuring an eye-catching LED Tube design. At the rear, the LED taillights present a sleeker profile. XLE and Limited models feature a chrome trim garnish on the rear bumper. The new exterior design complements an updated interior design that sets a high bar in the mid-size SUV segment. The refined cabin features new trims and the addition of several USB ports: With five of these throughout the interior, it’s never hard to find a spot to plug in and charge. What the 2017 Toyota Highlander’s style promises, the performance delivers. Conventionally-powered gasoline models receive a revised, 3.5L D-4S Direct Injection V6 that generates up to 295 HP and is coupled with a new eight-speed automatic transmission. On AWD models, this engine is enhanced with Toyota’s Stop and Start Engine System. This conserves fuel by allowing the engine to shut off when the vehicle comes to a complete stop, and restart almost instantly when the driver lifts their foot off the brake pedal. Hybrid models also feature an updated, 292 peak HP, 3.5L Direct Injection V6 mated to an electronically controlled continuously variable transmission as part of the vehicle’s Hybrid Synergy Drive. Regardless of power train, the new engines deliver more horsepower, enhanced fuel efficiency, and a more direct driving feel thanks to an extended lock-up range. This front-wheel drive model seats eight and comes standard equipped with many premium features – including a display audio system with 6.1” touch screen, Bluetooth capability, 60/40 split folding 2nd row bench seat with slide and recline adjustments, a 60/40 split folding 3rd row bench seat with recline adjustments, steering wheel-mounted controls for audio, voice recognition and phone, dual zone climate control, keyless entry, 18” alloy wheels and more. 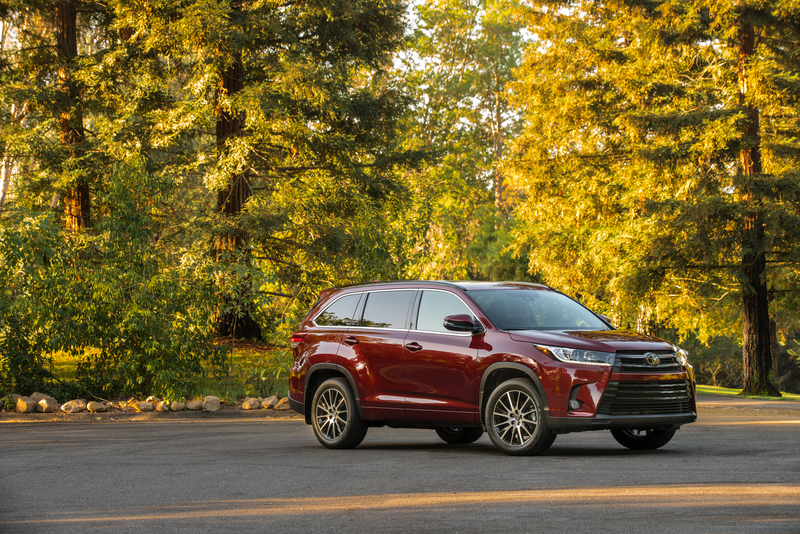 This model offers all the same features as the front wheel drive Highlander LE, plus the added all-weather driving confidence of Toyota’s Active Torque all-wheel-drive system. This model features many enhancements over the LE trim level. New for 2017, it includes a four-way power front passenger seat, plus the addition of the Blind Spot Monitor and Rear Cross Traffic Alert Systems. Other standard features include a display audio system with 8” touch screen, navigation system, advanced voice recognition, integrated XM Satellite Radio, the Driver EasySpeak system, heated front seats, eight-way power adjustable driver’s seat, a power adjustable front passenger’s seat, leather and Softex seat coverings, three-zone automatic climate control, a power moon roof, keyless entry with remote hatch release, the Smart Key System with Push Button Start, 19” alloy wheels, a power rear door with jam protection and flip-up hatch window and more. This is a new model for 2017. It builds on the XLE AWD grade, enhancing Highlander with a sporty design. The Highlander SE features unique 19” black alloy wheels, a unique sport grille, black painted roof rails, special ambient interior lighting, 2nd row captain seats (for a seven-person capacity), unique black leather trimmed seats with silver stitching and pattern seat inserts, and is available with an exclusive exterior colour; Salsa Red Pearl. This model offers the best of everything, with many upgrades from the XLE model. New for 2017, the Limited AWD features 19” dark chrome clad wheels, the Bird’s Eye View Monitor, front and rear parking assist sonar and rain sensing wipers. Other standard features include a JBL Synthesis audio system with 12 speakers, display audio and 8” touch screen, heated and ventilated front seats, perforated leather and Softex seat coverings, a driver’s seat memory system, heated 2nd row captain’s seats (for a seven-person capacity) with a flip-up table, heated steering wheel, panoramic moon roof, dynamic back-up camera, Blind Spot Monitor with Rear Cross Traffic Alert, fog lamps and more. This model brings the advanced power and remarkable efficiency of the Toyota Hybrid Synergy Drive to the Highlander line. For 2017, new standard equipment on this trim level includes a four-way power passenger seat and the Blind Spot Monitor with Rear Cross Traffic Alert. Other standard features include a display audio system with 8” touch screen, navigation system, the Driver EasySpeak system, leather seat surfaces, an eight-way power adjustable driver’s seat, a power adjustable front passenger’s seat, a power moon roof, integrated garage door opener, power rear door with jam protection, keyless entry with hatch release, an anti-theft system, 19” alloy wheels, and more. This model offers it all – from style and prestige to remarkable efficiency. New for 2017, this model now features 19” dark chrome clad wheels, the Bird’s Eye View Monitor, and front and rear parking assist sonar. Building on the XLE model, other standard features include a JBL Synthesis audio system with 12 speakers, heated and ventilated front seats, perforated leather seating, a driver’s seat memory system, heated 2nd row captain’s seats (for a seven-person capacity), rain-sensing wipers, panoramic moon roof, and more. Toyota Canada Inc. (TCI) is the exclusive Canadian distributor of Toyota, Lexus and Scion vehicles. Toyota has sold over 5 million vehicles in Canada through a national network of 286 Toyota and Lexus dealerships. Toyota is dedicated to bringing safety, quality, dependability and reliability in the vehicles Canadians drive and the service they receive. TCI’s head office is located in Toronto, with regional offices in Vancouver, Calgary, Montreal and Halifax and parts distribution centres in Toronto and Vancouver. Toyota operates two manufacturing facilities in Canada. Having produced more than seven million vehicles, popular Canadian models built at these facilities include Toyota RAV4, Toyota Corolla, Lexus RX 350 and RX 450h hybrid.